This little experiment will show a phenomenon that you have probably seen already. This time, we are going to explain it ! 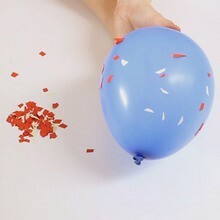 Static electricity makes the confetti stick to the balloon. Everything is made out of atoms. These atoms that are charged with electricity are made out of a nucleus and electrons that surround it. The nucleus needs a certain number of electrons to be electrically stable. However, when you rub the balloon, you take electrons away from the atoms. The balance is lost, and the nucleus tries to take electrons back. It will therefore take the confetti's electrons. Actually, it will even try to take the table electrons but it is too heavy! It is the same phenomenon as when you are brushing your hair, and it stays up! And it is even very similar for lightning! How to make this experiment? Rub it with the piece of fabric. Move it closer to the confetti. The confetti sticks to the balloon! If you watch closer, you will notice that they actually fly toward it!